We’ve been growing medicinal herbs for decades, and their return to the garden each spring is still one of the season’s great joys. At the tail end of winter, cold-hardy herbs like motherwort and lemon balm will start showing off new green leaves—followed shortly by purple-tinged anise hyssop, plush stinging nettles, and fragrant peppermint. Although it will be many more weeks before harvesting commences, their presence is a grand and hopeful sign of warmer days to come. Growing medicinal herbs can be your gateway to building a truly fresh and nourishing home apothecary. You’ll be hard-pressed to find herbs that are of higher quality than those grown by your own hand. And tending these plants is one of the very best ways to develop a deep and meaningful relationship with your medicine. To celebrate this love affair with garden-grown herbs, we’ve pulled together the best herb gardening resources from our blog, plus five muse-worthy resources that have enlivened and inspired our own gardens. These are our top ten must-have medicinals for the garden, including how to get them growing. It’s not easy choosing favorites, but we picked these for their medicinal usefulness, beauty, and adaptability to a wide range of climates. Your herb garden is a space for exciting creative expression—where medicine and beauty can flourish side by side. Here, Juliet shares her tips for creating a garden that fulfills all your herbal hopes and botanical desires. Everything you ever wanted to know about starting herbs from seed! Medicinals can be trickier to germinate than veggies—they often require special pre-treatment and some extra pampering. All of which is worth the wonder of watching these unique plants push their first sprouts into the world. Plus, you’ll save money and be able to cultivate herbs you might not be able to purchase otherwise. Root division is a simple way to add herbs to your garden. It’s handy for propagating dozens of well-loved plants, including mint, bee balm, Echinacea, comfrey, lemon balm, calamus, and elecampane. Learn how to make your own divisions and share the abundance with your friends! Even in urban spaces, you can turn your garden into a productive medicinal paradise! If you have limited outdoor space—or just a patio or balcony—Juliet has a number of tips to help you reap the most from your plantings. Plus, seven herbs that will bring home the bounty in small spaces. The Medicinal Herb Grower: A Guide for Cultivating Plants that Heal (Volume 1) by Richo Cech. A good beginning book to cultivating plants in general, but with a focus on medicinal herbs. Filled with herbal anecdotes and cultivation details for many of our most treasured medicinal allies. Propagation, germination, soil preparation, harvesting, and seed-saving are all covered. Richo is a long-time herb gardener and seed-saver, and owns Strictly Medicinal Seeds, our favorite source for herb seeds and many medicinal plants—including trees, shrubs, and cacti (shipping is available). Herbal Renaissance: Growing, Using and Understanding Herbs in the Modern World by Steven Foster. An excellent all–around reference for popular Western herbs. Includes information on medicinal use, processing and cultivation for each herb. This is one of my top-shelf references; the detail and experience Foster shares so gracefully makes this an indispensable source for any herb gardener. Illustrated Herb Encyclopedia: A Complete Culinary, Cosmetic, Medicinal, and Ornamental Guide to Herbs by Kathi Keville. One of my long-time favorite herb references. Provides more cultivation information than most general herbals, accompanied by beautiful illustrations. Kathi includes loads of recipes, historical references, medicinal uses, and aromatherapy tips. The videos on Deb Soule’s YouTube channel are a joy to behold, as she truly loves and connects with plants. She shares invaluable wisdom on garden herbs, including information on cultivation, medicinal uses, harvesting, and preparation. Deb is the founder of Avena Botanicals, a handcrafted herbal remedies business that grows nearly all of their own herbs on a certified biodynamic farm in Midcoast Maine. She also writes a fantastic blog and is the author of How to Move Like a Gardener: Planting and Preparing Medicines from Plants. Joe Hollis’s YouTube channel shares an incredible collection of videos on Western and Chinese herbs that can be cultivated in the garden. Joe lives at Mountain Gardens, a botanical paradise featuring the largest collection of native Appalachian and Chinese medicinal herbs in the eastern United States. Joe sells plants and seeds, shares a self-serve library and herbal apothecary, and offers plenty of incredible classes, which you can check out here. We know there are plenty more fantastic herb gardening resources on the web. If you have a personal favorite, we’d love to hear about it! And if you enjoy following herbal writers online, check out the blog roll of Rosalee de la Forêt: A Complete List of Herbal Blogs. Want to take a deeper dive into medicinal herb cultivation? 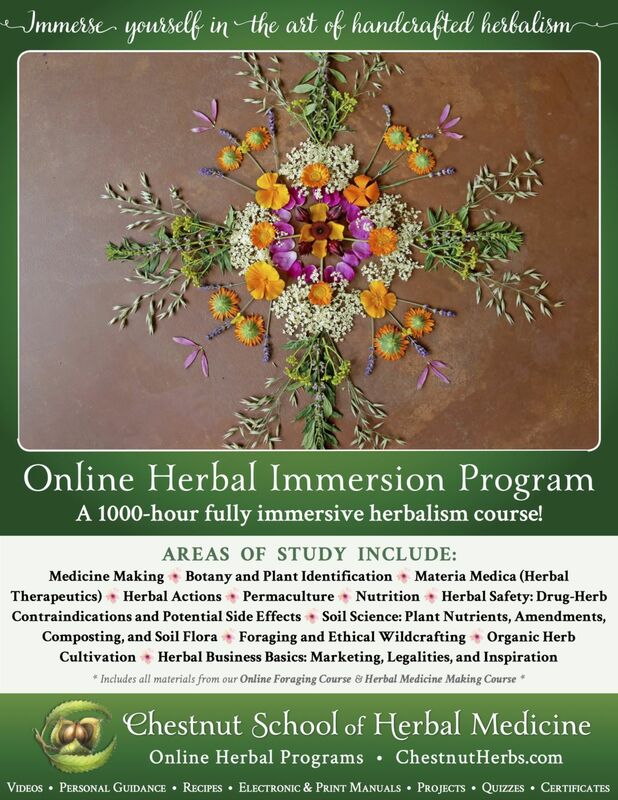 Our 1,000-hour Herbal Immersion Program is the most comprehensive handcrafted online herbal course available, covering botany, foraging, herb cultivation, medicine making, and therapeutics. Looking for more blog articles about medicinal herb cultivation? Remember, we’ve got a wheelbarrow-full of herb gardening and seed starting resources on the blog. Come on over to browse, pick up our personal gardening tips, and learn about our can’t-live-without garden medicinals.